I like cake, but am no fan of frosting. When I'm at a wedding or birthday party, I happily eat around the icing like crusts on a PB&J. My mom used to make naked cupcakes for me when I was little, sparing my allotment from any icing contamination. Even ice cream cakes seem misnamed. In my mind, it's supposed to only be ice cream in the shape of a cake. Like the name advertises, right? We don't need no stinking icing on it. I think the issue is that icing's just too sugary for me. I know, the irony. . . . This is coming from a girl who drinks Coke, which has a shocking 39 grams of sugar — or almost 10 sugar cubes — in a can, but somehow it's disguised as a refreshing beverage. Icing on the other hand is just a big ole mouthful of whipped sugar that seems excessive and unnecessary. It probably won't shock you to hear that I was also not the person who would upend a can of ReddiWip and spray a mound into my mouth. Easy Cheese yes, but whipped cream no. Since I'm talking about my food idiosyncrasies here, let me also tell you where I stand on crispy cookies. Far away from that jar. You see, I like my cookies chewy and bendy. I don't see the point in taking a bite of a cookie only to have it crumble to nothingness in front of your eyes and all over your lap. I religiously under-bake my homemade cookies in an effort to achieve the perfect point of chewiness, which is risky because it can often come out like raw dough. While I used to eat a lot of raw cookie dough (if you've ever been in a sorority, you know what I'm talking about), it's not really something to serve to guests. Although one time I did serve a truly inappropriate dessert to guests. I was in middle school and my friend Megan and I decided to make Rice Crispy treats for a barbecue. We were gabbing and stirring the marshmallows on the stove top with a rubber spatula. I lifted up the spatula after the contents of the pot looked good and melted — only to find that the spatula had melted INTO the melted marshmallows! This was obviously before the days of silicone cooking utensils! Like many thirteen year olds, we don't always make the best judgment calls. So Megan and I just kept making the treats, wondering what's the worst that could happen. Well no one died of poisoning, but the Rice Crispy treats had an undeniable plastic-y taste to them. One of my favorite things about Halloween is pumpkin! Not pumpkins but canned pumpkin you use for pumpkin pie, pumpkin bread, and other lovely pumpkin treats. I don't know why we don't bake with it year-round. I love the homey spices and the subtle sweetness — not like a mouthful of icing. 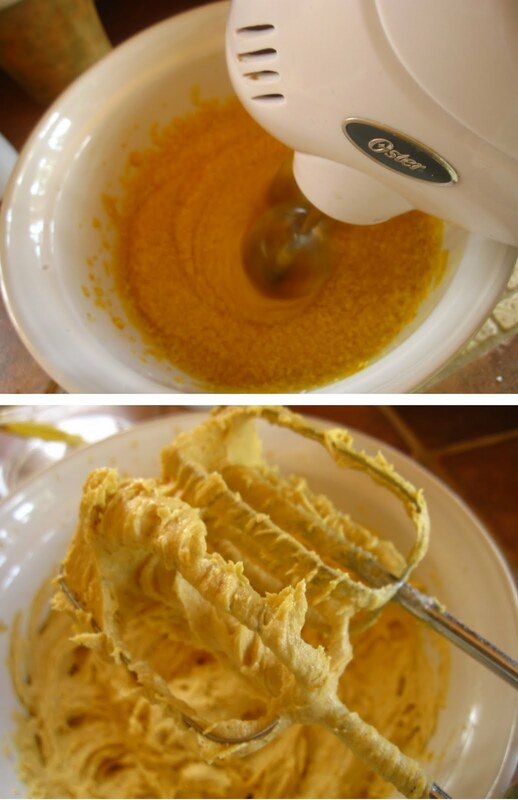 My friend, Val, posted a photo on Facebook last week of a big, beautiful plate of pumpkin cookies she'd just made. In truth, I'd just returned from the gym, yet my first thought was, "Let's go to the store right now, buy all these ingredients, bake these, and then eat them for breakfast!" Sad but true. Yes, I loved that they were pumpkin, but I could also tell that these were not your average crispy cookie. Oh no, these were like mini domes of cake! With no icing to ruin them! Well, I did manage to wait a few days to make these, and served them as dessert to a group of girlfriends who came over for dinner on Friday. They were just as good as I imagined, with a moist texture, hints of cinnamon and nutmeg, and studded with semi-sweet chocolate chips for the perfect foil. They were truly the best frosting-free cakes disguised as cookies I've ever had. I could easily have thrown back two dozen of these, but I did the right thing by sending my friends home with the majority of these cake-cookies. I did say majority. I admit to keeping a small Ziploc bag of these delights. And I'm happy to report I ate the last one for breakfast this morning (as soon as I got back from the gym). Now I see why people bake with pumpkin only once a year. It's too tempting otherwise. Preheat over to 350 degrees. With a mixer, cream the sugar and shortening for 3-4 minutes. Mix in the egg, vanilla and pumpkin. In another bowl, whisk together the flour, salt, baking soda, baking powder and cinnamon. Add flour mixture to the pumpkin mixture. Mix until just combined. With a spoon, stir in the chocolate chips. Drop spoonfuls onto a cookie sheet lined with parchment paper (or lightly greased) and bake for 10-15 minutes. Agreed on the frosting issue, too. I'm open to all types of cookies, however, and the ones you discuss above sound great to me.